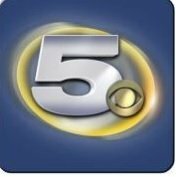 News TV Channel / WKRG-TV, virtual channel 5 (UHF digital channel 27), is a CBS-affiliated television station licensed to Mobile, Alabama, United States and also serving Pensacola, Florida. The station is owned by the Nexstar Media Group as part of a duopoly with Gulf Shores, Alabama-licensed CW affiliate WFNA (channel 55). The two stations share studios on Broadcast Drive in southwest Mobile; WKRG's transmitter is located in unincorporated Baldwin County near Spanish Fort, Alabama.